In recovery, “being clean”, sobriety are all words or phrases (if you will) that are thrown around a lot and used interchangeably especially by those in the community of substance users. We’re guilty of it ourselves, and we ought to know the difference between each one!. And believe it or not, there is a difference between the terms. 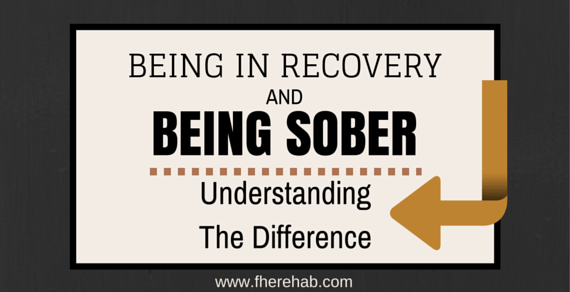 You can’t be ‘in recovery’ without being sober, but you can be sober without being in recovery. How? Well, simply put, being sober just means you’re not currently affected by a chemical substance, generally speaking, alcohol. It means you aren’t drunk or high. While, technically, this could mean you simply haven’t had a drink or drug in a while, it normally means that you are not actively living a life where you drink or use a drug. Being ‘clean’, on the other hand, specifically refers to drugs. There are some divisions in the addiction world between drug users and alcohol users. While we generally appreciate that we have similar experiences and struggle with the same vices, alcoholics and drug users often separate into different groups. Likewise, the terms sober and ‘clean’ help differentiate the groups. The terminology isn’t sacred for many, but some do insist it’s important, not just for the healing process, but for people seeking help and opening up in front of their peers. Recovery, then, is the healing or process of becoming better emotionally, mentally, physically, and spiritually while sober and/or clean. So while many of us can put the drugs and alcohol down and become sober or clean, that doesn’t necessarily mean that we are in recovery. Recovery is the active practice of working towards your betterment, not just abstaining from a substance. Recovery is working through the issues that caused you to drink and use drugs. Sober is just putting them down. Recovery is realizing that drugs and alcohol were the solution to the problem and not the problem themselves. Recovery is about changing our behavior. Sobriety is just about changing our drinking and using habits. Recovery means healing. Sobriety just means sober. Recovery is learning to love our selves and others. Recovery is finding peace. Recovery is continually becoming a better person. Recovery is owning up to our actions right or wrong and is giving up the victim role. Recovery is making amends, and not just saying we’re sorry. Recovery is action. Recovery is daily. Recovery isn’t a one-time thing, it is a lifelong journey. Sober or clean—means just that. You are physically sober and clean. Do you see where we are going with this? Recovery is so much more than just putting the substances down. Anyone can put the drugs and drink away for a day and call themselves sober, but not everyone can say they are in recovery. Not everyone can say they have begun the journey to better themselves. Whatever it is you are doing to make yourself better each day, whatever you are doing to put behind you the person you were while using, is in recovery. You are healing. You are getting better. Whether you are doing it through therapy, a 12 step program, treatment, church, or any other spiritual route, life coaching, personal development workshops, or getting involved in holistic healing stuff like yoga, acupuncture, etc. – you are on your journey in recovery and it is so much more than just being sober. If you are in it you know. Recovery offers you a lifelong, wonderful experience of getting to give life your best shot every day. Life isn’t about just not using on a daily basis, it is about having the human experience that is living as well. Of course, recovery wouldn’t be possible if you weren’t sober first, so staying sober is one of the most important factors for recovery, but it isn’t the only one. Recovery is an individual experience of getting better. So, are you ready to begin your recovery? Have you? What does your recovery look like? How did you get better?